Because I can just steal it from Bill. The artist is Tom Chantrell. I'm done with filing taxes. Yeah. Thanks. How does that helmet attach at the neck? I have to secure some locations for Clonehunter. Some of the sets are going to have some very out-of-focus backgrounds, that's for sure. I plan to light the "bar" with lights that point down and the "club" with lights that point up. Yeah. Planning. I just love submarines crashed on the desert floor. Love. Them. This "matrix tone generator" has taken up too much of my time today already. And look, a reasoned look at the Columbine massacre. Sorry reality doesn't fit into the story each interest group had ready for it! They weren't bullied, they weren't going after "Christians", they weren't on anti-depressants. Just psychopaths. 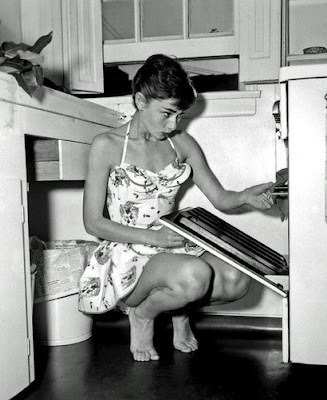 Audrey Hepburn's English parents were fascists. But she was sent to live in the Netherlands while England was being bombed and ended up living in the Netherlands under German occupation. I told her that Holden character had a vasectomy and was no good for her but did she listen? Wait, seriously? This site says this movie was never made. Dear Lord, man! We have to make it!